Dating is never easy but finding the perfect partner when you live in a tiny, remote village in the Vietnamese mountains is almost impossible. The solution? A love market. For generations, young people from the patchwork of ethnic minority groups in northern Vietnam have gone to the local town of Sapa on a Saturday night to find their future spouse. "It was so exciting. I wanted to see if I would meet any nice girls," traditional Hmong musician Giang A Vang, 50, said of his first visit to the love market three decades ago. One girl in particular stood out from the crowd. "When I saw her for the first time I was playing my violin. I asked her if she liked it, if she liked me. I was a little nervous," he said. Fortunately, his affections were returned. For the next few weeks, he came back to the market to meet his sweetheart Vang Thi Xo and play music together as part of a Hmong courtship ritual -- him on a traditional violin and she playing a leaf. 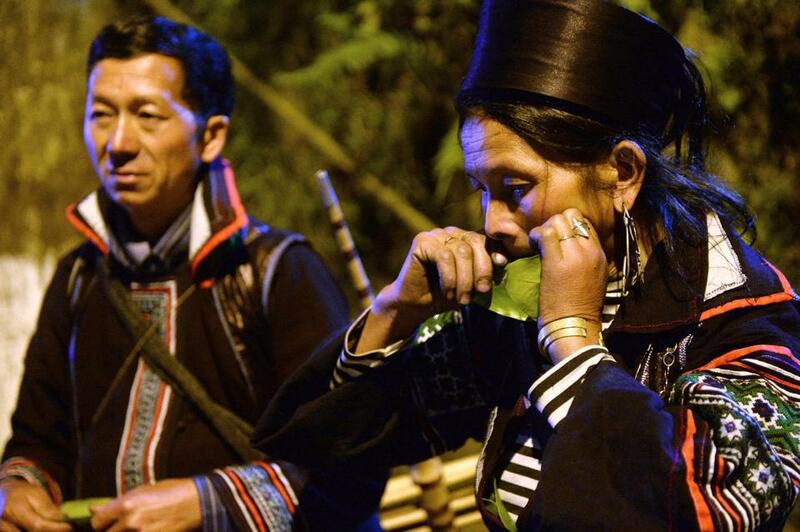 The Hmong play a leaf -- usually a banana leaf -- by curling it up and positioning it in the mouth so it vibrates when blown to make a loud, high pitched sound. The pair soon married and have been together ever since. "I was a very lucky man to meet her in the market, but I think she was lucky to meet me too!" Vang said. In recent years, Sapa has become a hugely popular tourist destination, with foreign and Vietnamese visitors flocking to the picturesque town, famed for its terraced rice paddies and stunning scenery. Sapa is the main attraction of Lao Cai province, which received 1.2 million tourists in 2013, up from just 360,000 in 2003, according to official figures. While this influx has brought a measure of prosperity and development, it also has negatively affected local customs and traditions, Vang Thi Xo said. "The love market is very special for me as it was how I could meet a good husband like him," she said. "Now I don't like it, as people are playing music just for fun, for the tourists to get money, and we are losing part of our culture." As more young people attend schools or work in Sapa for tourism they do not really need the love market or arranged marriages, which were also once traditional in the area, said musician Vang. "They might meet a boyfriend or girlfriend in the village, or in town... they choose for themselves," he said. "I want my children to find their own husband and wife -- it is better that way." Sapa does not have an airport and the area is only reachable from the capital Hanoi either by an overnight train or a long drive. But its remoteness has not deterred tourists. "So many Vietnamese tourists came and they gave money to (ethnic minority) couples who were playing music to each other at the love market," said Ly Thi My, 54, a Hmong woman who met her husband there. "Now people just perform -- they aren't doing it for real," she said sadly. But it is not just tourism that has transformed the local tribes' traditions. Mobile phones and Internet have also played a part, My said. "Before, the boy would whistle outside the girl's house and she would come and play a leaf to show she was interested," she said, describing traditional Hmong courtship rituals. "Now they have mobile phones!" she said. "It is too easy now. It was a nice challenge to find love before. I would prefer to go back 20 years." For Ly Thi Do, 52, of the Black Hmong tribe, the love market has become "a joke". "Before all the tourists, when I was young, when we still used to grow opium and pan gold in the rivers, the market was just for locals," she said. "Now it's a business... everyone comes to make money and sell trinkets." Sapa has long been a tourist destination. When Vietnam was a French colony, the hilltop town was a popular retreat, although the colonial-era villas were mostly burned down by Chinese troops during a 1979 border war. "Tourism has been here for 100 years... It's somewhat disrespectful to say tourism has changed the ethnic minorities' culture," said Chris Carnovale, a tourism instructor at Canada's Capilano University. "The Hmong culture is very strong. If they want to change, they change," said Carnovale, who manages a project in the Sapa area helping ethnic minority groups learn how to offer homestays to tourists. Because Sapa has become so popular with Vietnamese tourists from the lowlands, "the love market has evolved" with it becoming more of a meeting point for tourists than locals, he said. "There are still true Hmong love markets -- but I'm not telling you when and where," he said. But even at the original love market in Sapa, amidst the throngs of camera-touting Vietnamese and foreign tourists, some young locals still come looking for a relationship. Ha Ngasu, 26, a farmer, has been to the love market several times to look for a wife. "My parents met at the love market, so I've come here as well," he told AFP as he sat next to his date for the evening, Giang Thi Si, 16. The pair -- who had seen each other in their village but never spoken -- spent the evening at the love market chatting and enjoying the live music -- now amplified and on a stage purpose-built by local authorities for tourism. "I like being with him here," said Si. "I'm not sure it is love but I do like him a bit." Founded in 2008, Openchoi.net is an website collecting information and sharing experiences on backpack and / or low cost travelling for all passionate travelers. Believing that “You can travel on their own”, we commit to bringing about all exciting, updated and valid travel information that you need. Hello everyone! I'm Tung Nguyen, currently living in Vietnam. I am a lover of Tourism and Travel, I love to go places and look forward to exploring many things in life.